This page has all the latest news from the Rally Team along with a few topical images. We had a great weekend at the 2018 Rally. The weather was glorious, and we had even more vintage vehicles on display than last year. 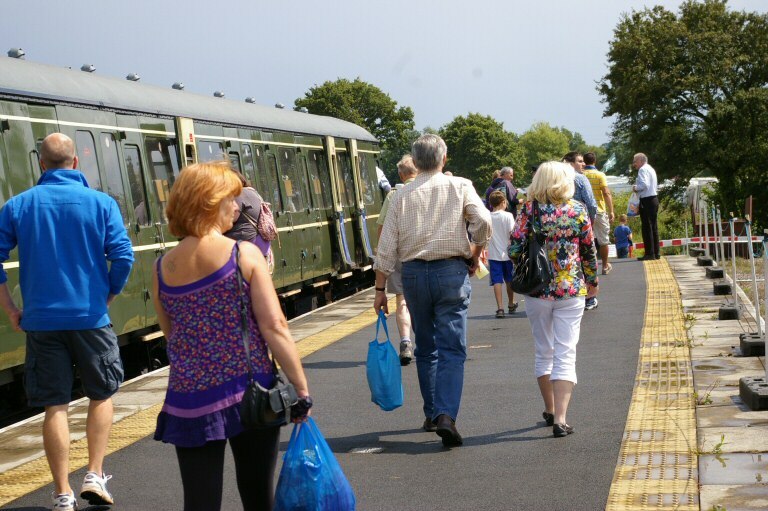 Particular successes were the new railway siding, which allowed us to display the restored historic coaches, the larger steam section, and the new layout, which made it easier for everyone to see the different exhibits. The hot weather meant that the ice cream stalls and the bar were particularly popular. We are very grateful to our exhibitors, who displayed their cherished vehicles for everyone to enjoy. In return, many of then enjoyed a special train visit to the historic port of Watchet last Friday. They had a great reception there, and we are most grateful to the traders and people of Watchet for their welcome. Once again, our dedicated band of volunteers worked their socks off to prepare and staff the Rally, welcome the visitors, and pack it all away after. Nothing would be possible without our volunteers, and we are so grateful for their hard work. We are having problems with the mobile signal at the Rally Site and may not be able to accept payments by card on Sunday. We would suggest you bring cash as an alternative. Rob Lindley's picture shows just a few of the steam exhibits lined up at Norton Fitzwarren on 3 August 2018. The Rally beer tent will feature no less than 21 different real ales, all brewed in the County of Somerset. Leading the way, we have six ales from Quantock Brewery of Bishops Lydeard and three beers from each of Cotleigh Brewery (Wiveliscombe), Exmoor Ales (Wiveliscombe), Fine Tuned (Langport), Pitchfork (West Hewish) and Yeovil Ales (Yeovil). Cider is also very well represented, with well over a dozen different real ciders from the many and varied Somerset producers. 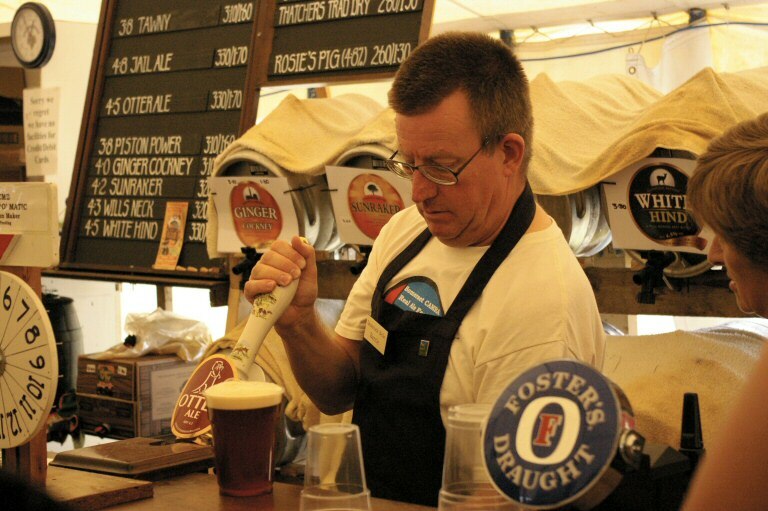 Somerset CAMRA volunteers will be supporting the regular beer tent crew. Hope to see you! Here are the times of the free shuttle train service between Bishops Lydeard and the Steam & Vintage Rally at Norton Fitzwarren. Journey time is approximately ten minutes. The online ticket facility will be available until 10am on 1 August 2018. Any online transactions after 10am on 1 August 2018 may not be processed. A reminder that purchasers are required to print a paper copy of their online ticket and to bring the paper copy to the Rally Gate for validation. The Rally signs are going up in Bishops Lydeard! We are all looking forward to another fun weekend at the Rally on 4 & 5 August. Why not take advantage of our online ticket offer: Two days for the price of one. (Adults £12, seniors £10) This offer is only available in advance, and will close before the Rally. So why not follow the link now. The roadway at the Rally Site has been widened as the existing roadway was not wide enough for traffic to pass by without going on the grass, and churning up the ground. More hard work by the Rally Working Group. We are very much looking forward to seeing our volunteers again for this year's event. Most positions are now filled, but we are keen to have a few more. Specifically, we are keen to hear from anyone who would like to join our team of car park marshals and programme sellers. No experience is necessary; we will give you training, a hi-vis vest, lunch and plenty of drinks. There is also a very special opportunity coming up soon for our volunteers: details will be out shortly. So, if you are interested, please download the volunteer application form, or ring 01823 433856. We look forward to hearing from you. See the Volunteers page for more information. We have had a great response to our invitation for exhibitors, and most sections are now full, and cannot accept any further entries. These are: Cars, land rovers, motorbikes, military, stationary engines, models miniature steam. We are still waiting for a few applications for the full size steam and commercial section: please do get these in as soon as possible. Joining details will be sent out to booked exhibitors very soon. The Rally team are pleased to announce advance tickets can now be purchased online. See the Tickets Page. Ticket prices are pegged at last year's prices - £12 for an Adult Day Ticket and £10 for a Senior Citizen Day Ticket. There is no charge for a child accompanied by a valid ticket holder. And once again, two for the price of one! Day tickets purchased online are valid on both days of the Rally. Invites have been sent out to our regular Exhibitors and Traders, and bookings are coming in fast, with many of our areas already booked up. We are looking to complete the booking process by the end of May. So, if you want to make sure of your place, please get your booking back to us by 31st May. Contact us by email: wsrarally@gmail.com. The Rally team are hard at work planning the 2018 event, which will be held on the 4th and 5th of August at our site in Norton Fitzwarren. We will retain the many successful features from last year, including the early train from Minehead on both days. Invitations are going out to exhibitors and traders: there is more information on their part of the website. We look forward to seeing you for 4th & 5th August. Invitations are now going out to our regular exhibitors: yours should arrive in the next few weeks, if it is not with you already. We look forward to receiving your completed booking form back. We welcome applications from new exhibitors, especially for our larger Steam section. Contact us by email: wsrarally@gmail.com. We have a new destination for our ever-popular Somerset Coast Express on Friday evening. This year, we will visit Watchet an historic port, where we will have a warm welcome from the community, with lots of catering and entertainment laid on for you. Details will go out with the booking forms. Invitations are now going out to our regular traders: yours should arrive in the next few weeks, if it is not with you already. We look forward to receiving your completed booking form back. We also welcome new applications for our trade, craft or catering areas. Contact us by email: wsrarally@gmail.com. We have a new destination for our ever-popular Somerset Coast Express on Friday evening. This year, we will visit Watchet, an historic port, where we will have a warm welcome from the community, with lots of catering and entertainment laid on for you. Details will go out with the booking forms.